A look at the latest drills within the context of the bilateral defense relationship. Over the past week, the United States and Malaysia held another iteration of a decades-old bilateral air force exercise. The holding of the drills was yet another demonstration of continued cooperation on the defense side between the two countries amid the new change in government in Malaysia that just took place in May. As I have noted before in these pages, despite some lingering differences, the United States and Malaysia enjoy a strong defense relationship, as manifested across a range of areas such as counterterrorism and maritime security, and through a variety of means including visits, exchanges, and exercises. With respect to exercises, these include Malaysia’s participation in multilateral ones like Pacific Partnership and the Southeast Asia Cooperation and Training (SEACAT) as well as bilateral ones such as Exercise Keris Strike. These interactions have largely continued on during the Trump administration, albeit with some minor changes. (See: “The Real Test for US-Malaysia Relations in the Trump Era”). And further questions had been asked about the future shape of defense cooperation following a new government coming to power in May in Malaysia (See: “What Does Malaysia’s Shock Election Result Mean for its Future?“). 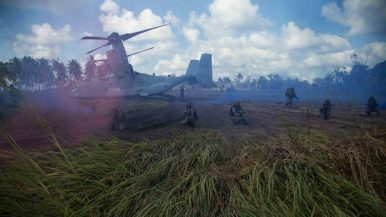 One of the exercises is Cope Taufan, a biennial Pacific Air Forces bilateral tactical airlift exercise which both sides have conducted since the early 1980s. The exercise provides an opportunity for both sides to improve combined readiness and boost interoperability through various means, including exchanging techniques and procedures as well as training comprising aircrew and maintenance personnel. Last week, the defense relationship was in the headlines again as the two countries held another iteration of Cope Taufan, following the last iteration which had been held in July 2016. Cope Taufan 18 (CT18) was held from July 16 to 20 at various air bases and other locations in Malaysia. According to the U.S. Pacific Air Forces, about 500 service members from the U.S. Air Force 36th Airlift Squadron, Yokota Air Base (AB), Japan, and the RMAF. On the U.S. side, participating assets included the U.S. Air Force C-130J Super Hercules aircraft, and on the Malaysia side, RMAF aircraft were involved as well though details were not publicly released. U.S. Pacific Air Forces had characterized the range of activities for Cope Taufan 18 to include operations in air superiority, airborne command and control, close air support, interdiction, air refueling and tactical airlift and air drop. Few additional specifics were disclosed by both sides on the exercises. But as the United States and Malaysia continue to find opportunities to further their defense ties under the new government, such interactions will remain useful to watch to get a sense for the future shape of defense collaboration. A look at the significance of a recent engagement between the two sides for broader bilateral ties. US, Malaysia Launch Naval Exercise After Najib-Trump SummitUS, Malaysia Hold Military Exercise Tiger Strike 2017What Does Mahathir’s Return Mean for Malaysia’s Foreign Policy?Mahathir Visit Spotlights US-Malaysia Relations Under New GovernmentA New Philippines Military Boost for RIMPAC 2020?